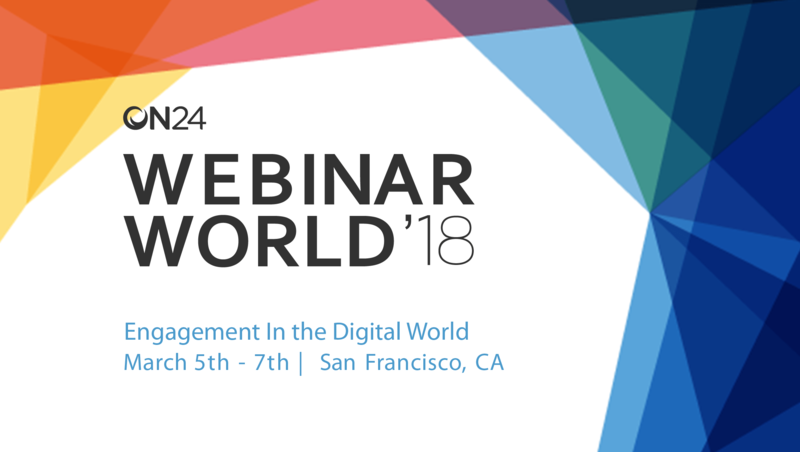 Fresh on the heels of ON24's annual Webinar World conference in San Francisco, here's one big idea for your content strategy in 2018: your webinars that incorporate storytelling and empathy will be the most successful. It means that you should plan to do more than simply give webinars that communicate knowledge, transfer information, share know-how and solutions. That's a good start, but going forward, to create true engagement with clients and potential clients, produce webinars that also articulate an empathy for the audience facing those problems. Focusing on people means, among other things, you avoid titles like Tax Reform Legislation Signed Into Law in favor of those like Small Business Owners Positioned to Benefit from Tax Reform. It means you don’t talk about “my client, a Fortune 500 bank…” but instead “my client, the General Counsel at a Fortune 500 bank…” And it means that you give names to the people in your examples, so that webinar participants create an image in their mind of a person facing a problem and how you helped them, not an abstract situation that you resolved. Speaking in the first person gives you authenticity and authority over your subject matter. It means you’ve personally done the things you’re talking about. It telegraphs your personal interest in the topics you present: “this is what I do, this is what I like, this is what I’m good at.” Most importantly, using “I” when you speak allows viewers to connect with the image on the screen as a person. That’s a crucial element for communicating empathy. It takes no great stretch of the imagination to consider that most participants didn’t sign up for your webinar because they wanted to better understand eDiscovery or how to respond to a cybersecurity incident or even how to rewrite workplace drug policies that comply with new state marijuana laws. They signed up because they want to do their jobs better. Maybe their boss told them they had to participate. Maybe they’re trying to learn more so they can put in for a promotion. Whatever the reason, remember that what matters most to your audience isn’t the law, but the impact of the law on them, every day. Organize your presentation like you would any story: start it off with a problem, identify the characters, describe their struggles. Draw your audience in with a narrative that is meaningful to them. Remember that your audience wants to empathize, too, so give them a chance to do so with a well-constructed story featuring people in situations with which that they can identify. Obviously, there’s a time and a place for webinars that are highly technical, that require you to go into the minute details of, for example, the differences between Form 12A (6.1) and Form 12A (6.2). If you’re not presenting on that topic, however, don’t go into the weeds to demonstrate your knowledge of the legal issues you’re addressing: your audience will trust your ability to dive into the minutiae when you need to. And more likely than not, they’ll appreciate the webinar all the more. You can get into the weeds in the follow up. How will your firm use stories to communicate empathy? I’d love to hear about it.